by Paul Mitchener, 2015, 111 pages. A Swords and Sandals Roleplaying Game. D101 Games. 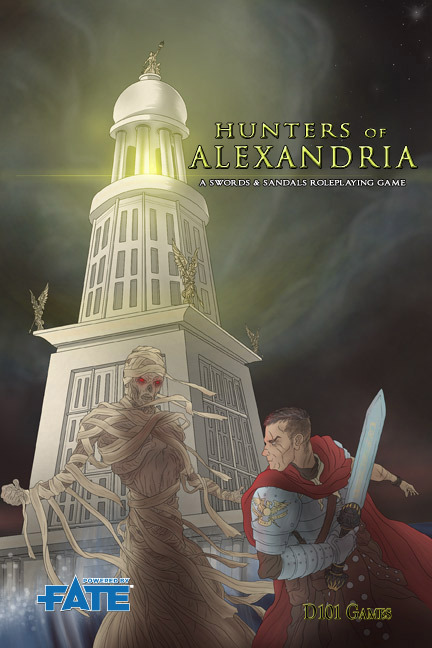 Hunters of Alexandria is a sweet little RPG by the incalculable Dr. Paul Mitchener with an added scenario by publisher Newt Newport. The game is set in Roman Alexandria in the year 753 after the foundation of Rome. That's 1 AD to you and me...well, to me anyway; you might be more of a CE person. Anyway, the book is set in ancient Alexandria when it is a thriving city under Roman rule. The conceit is that all the players are part of an organization called The Venatores (or Hunters, if you're like me and have a North American education and didn't learn some cool words in Latin) and your job is to seek out and trouble-shoot supernatural threats to the city and empire. And why not? Roman Alexandria is chock full of larvae lamiae, lares, and lycanthropes, not to mention more exotic things that have creeped in from nearby Aegyptus, like ghouls, sphinxes, and sha. The book offers a capsule history of Alexandria, a gazetteer of places in the city, some sample characters, a who's who of the city, factions for the PCs to rub up against, some scenario outlines, a full adventure, and all the rules you need to play. Rules are a modified version of fate, but you don't need a copy of fate to play. The game is light enough that you can pick up and play with minimal preparation, and it can do this because you, yes you, can fill in all the blanks you need from your own imagination of what a Roman city is like. Setting the game in Roman Alexandria is actually a brilliant stoke, because it's just exotic enough to give a sense of wonder, and yet familiar enough to make playing there easy. As good as it is, I do have a few small quibbles with the book. It really could use another pass through an editor or proofreader, though the errors are not significant enough to impede one's enjoyment. And the included scenario, although it does an excellent job of making use of the core text and bringing the setting alive, will need to be given some thought before running it to smooth out some structural inconsistencies – for example some scenes are connected by threads so silky I think the players will easily miss their connection, and the ending will need to be given some thought as none of the 4 possible resolutions presented actually deals with what I think the the most likely outcome. Lastly, there is some questionable advice in this scenario – it's a mystery and the text advises you not to give the players advice when they get stuck (even when the scenario writer doesn't provide enough clues). If you follow this, you may well end up in one of those embarrassing situations where the game grinds to a halt because nobody knows what to do next, and you'll be forced to write a Gumshoe system knock-off - and nobody wants that. I'm happy to be able to recommend this game. It's short. It's sweet. It's fun. The hiccups in the scenario are easily overcome. And you all need more ancient history in your gaming life than you currently have – stop mumbling, you know it's true! Duo pollice! Paul Mitchener is a member of this club and a friend of mine, but hopefully that didn't influence my opinion too much. I purchased my copy direct from D101. I think there's a lot of scope for expanding with a sort of 'city breaks' book that gives adventurers a wide variety of places to visit on travels from Alexandria. There are a lot of very interesting but less famous Egyptian locales that would really lend that feeling of wonder and mystery to an adventure. And in this case I'd certainly include the Fayyum city of Arsinoe in Arcadia - aka Crocodilopolis. From Wikipedia: "The city worshiped a tamed sacred crocodile called in Koine Petsuchos, "the Son of Soukhos", that was adorned with gold and gem pendants. The Petsoukhos lived in a special temple pond and was fed by the priests with food provided by visitors. When Petsuchos died, it was replaced by another." That's very cool on its own, but let's take this a step further and turn it into an RPG campaign. A bunch of Egyptian nmw, or Pataikos, servants of the cult of Ptah, wish to reclaim the treasures of their ancestors, unjustly robbed from them by the cult of Petsoukhos generations ago. On the advice of a priest of Thoth, they arrive for an unexpected party at the house of an unlikely burglar in Alexandria, whose door the Priest of Thoth had marked with a hieroglyph. The burglar is surprised by the intrusion, but politely provides many festive offerings to his guests. Before he knows it, the burglar agrees to set off on adventures with them and leaves Alexandria for the first time. 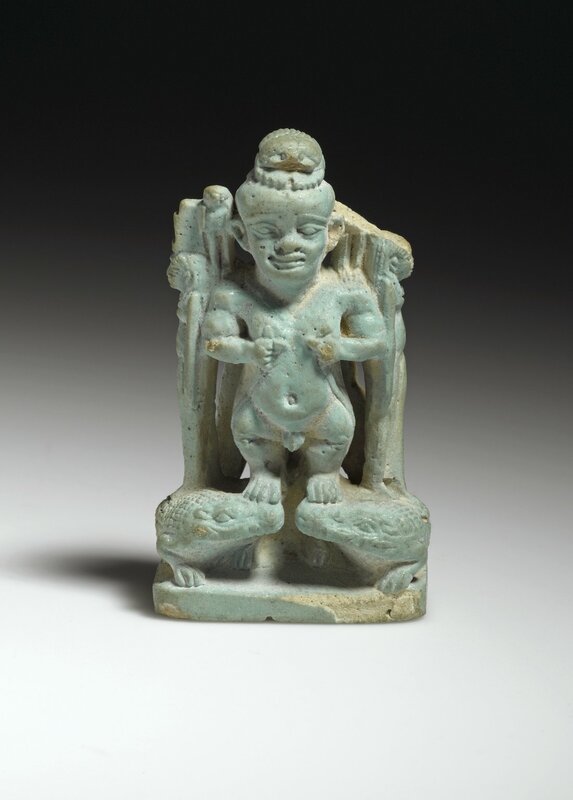 On their journeys they are nearly eaten by sphinxes, then captured by Troglodytes from the Erythrean Sea or Upper Nile area, and while trapped in the troglodyte caves the burglar meets an ancient mummy and wins a treasure from him - the Ring of Gyges, which turns the wearer invisible. Eventually they all get out of the caves, only to be hunted by jackals, and then rescued by griffins and deposited on an island in the river where they meet a man who can change into a hippopotamus. They next traverse the great reed beds and nearly run afoul of giant water striders. Finally they make it to Crocodilopolis and discover the secret way into the lair of Petshoukhos by moonlight. He lies within, encrusted in gems. Using the Ring of Gyges, the burglar steals the Eye of Osiris, which angers the great reptile, who then goes on a rampage in the city of Arsinoe where he is eventually killed by a local archer - but not before the town is nearly destroyed. While the local residents deal with the great croc, the patraikos move into the lair and reclaim it and its treasure for themselves, as their heritage. The burglar finds he must mediate between the two groups that want the treasure in payment for past wrongs. And to complicate matters, the angry troglodytes, jackals, and some bird pals show up seeking revenge. Now, what could you call this campaign? Maybe name it after the unexpected party that starts it all. Looking up the Egyptian word for festive offerings in the dictionary, that gives us Hbyt, so we'll call it The Hbyt. Sounds about right.